Are you currently looking to find top-quality CBD products from brands that you can trust? Or maybe you’re looking for one run by a licensed pharmacist? How about a pharmacist willing to test all of his products and share the results? Today, in this Green Roads CBD oil review, you’ll find out what our staff at the 420 Times thought of this brand. A 20 year veteran pharmacist created this company in 2011 in Florida. Now, Green Roads is a spectacular business and they are one of the biggest CBD manufacturers throughout the US. Interpreting CBD Colors: What Does the Color Mean Regarding CBD Oil? Is There a Reason to Add Terpenes to CBD Oil? Are Their Gummies New and Improved? Green Roads is a unique company selling high-quality CBD oil. Their oils include crystalline isolate CBD and full-spectrum CBD oil. What does this mean to the consumer? It means you’ll experience benefits from cannabinoids and terpenes, when added together to create the amazing results that pure CBD has to offer. At this time, no other brand is offering this combination. It shows us that Green Roads is not only a dominant player in the market, but they intend to offer the best products to their customers bar none. The colors of CBD oil falls in a range of dark brown to gold. Green Roads, on the other hand, mixes their CBD with vegetable glycerin which creates a white murky color. This combination used for vaping or sublingually is perfect for those looking to experience the stress relieving and pain diminishing benefits. Unfortunately, the vegetable glycerin combination leaves something to be desired. Some people believe that this oil doesn’t taste too great. We’ll let you be the judge. Mostly, the CBD oil sold by Green Roads is tainted with a slight smell of vegetable glycerin. According to many current and former users, when compared to other CBD oils, the Green Roads version is a lot less tart. But at the same time, the vegetable glycerin taste is quite strong and the smell also contains its characteristics. Lastly, for those concerned, the vegetable glycerin used by Green Roads is kosher grade. Some of you not only want the highest quality edible, but you also want something fun, different, and fresh, right? Just about every CBD company is making gummy bears at this point and there’s absolutely nothing wrong with that. Green Roads has taken a different path. They created CBD Froggies instead which is definitely a nice unique and different pace. The candy is huge to and comes in a four pack. Your options are to get 25 mg or 50 mg frogs, and each pack has four candies in them. They also sell individually wrapped candies as well, so if you want to test them out you can get a 25 mg for $4.99 and a 50 mg for $6.99 instead of ordering the bulk package. —–> Buy The Gummies Here – They are our #1 Ranked CBD Gummy Brand. Terpenes are all the rage today and Green Roads has taken notice. That’s why they currently sell terpene tinctures in a bottle for your enjoyment. They chose an interesting way to name their terpenes as well. They are named after each cannabis strain that it’s extracted from. So, the terpenes from the Strawberry AK strain are named what? If you guessed Strawberry AK Terpenes then you guessed correctly. Recently scientists have realized that your experience will become enhanced if you add terpenes to the CBD oil. By adding them, you create a more relaxed and energized product that you get by simply placing CBD under your tongue. So, the terpenes definitely do provide benefits and make the experience that much better. Green Roads knows they make high quality products and they want their customers to know this as well. That’s why they place a QR code directly on the bottle on the outside of the packaging. Just use your phone to take a picture and you’ll immediately pull up results of the lab tests for said product. Now you don’t have to waste your time going online and digging through results on a website. You can see the results right away on your phone without any hassle whatsoever. And based on what we’ve seen, Green Roads is performing the latest testing for toxins and potency because they want to continue delivering high quality products. Besides the frogs, Green Roads has taken it upon themselves to create even more new and improved gummies. The latest additions to their product line include relief toads, fruit bites, and gummy bears. These products are very small and bite-size. And they sell them in a childproof jar, which is obviously very important. As far as flavor goes, the relief toads and the fruit bites have a tasty fruity flavor. On the other hand, the gummies have a sour taste. So whether happened to like sweet or sour, they definitely have you covered both ways. They made our list of the top CBD gummies of 2019. Read all about it! They have a simple and straightforward return policy. If you are unhappy within the first 30 days, you can return the product for a full refund. It’s that simple. Green Roads takes their testing seriously. They post all of their results online and test for potency and purity. So you know that this company is doing right by each and every one of their customers. In fact, all of the hemp used in their products is certified organic and shipped straight from Colorado. So they use quality clean hemp, which means all of their products are high-caliber and deliver the goods. Hemp needs to be grown in an area that is clean because it’s a soil remediator. This means it pulls impurities and toxins directly from the soil. The East Asian companies selling hemp have dirty soil, which doesn’t leave a lot to be desired. They use the best CO2 extraction method, which means their CBD meets the gold standard. Their manufacturing process is perfect and passes muster every step of the way. As you can see, their high-quality potent products are clean and created using the best extraction methods. This company is one you can definitely trust. All of their products are tested and the results are posted online. Besides the products we’ve mentioned, they also sell coffee, tea, concentrates, syrups, and pet products. Their CBD oil is a mixture of crystalline isolate and full-spectrum CBD oil. Their products range from 100 mg to 1500 mg doses, they are made using kosher vegetable glycerin and terpenes of a proprietary blend. 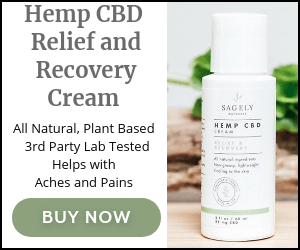 Their pain cream contains 150 mg of CBD in a 30 g bottle. The NFL Alumni Association endorses this product, it’s made in America, and it retails for $40. Lastly, their gummies consist of assorted flavors, have 30 gummies in each container, and each containerhas 300 mg of CBD and retails for $54.99.